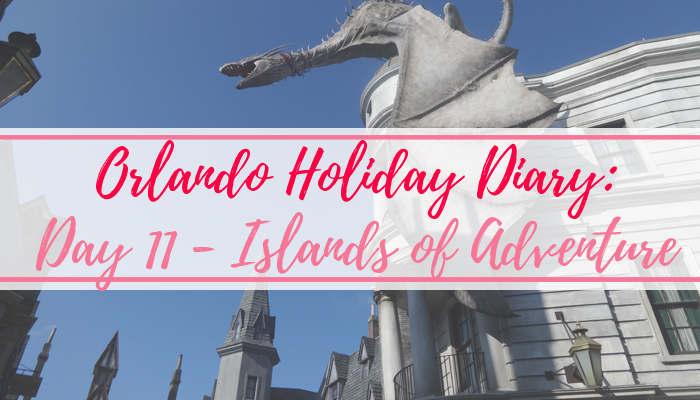 Tania Michele: Orlando Holiday Diary: Day 11 - Islands Of Adventure! 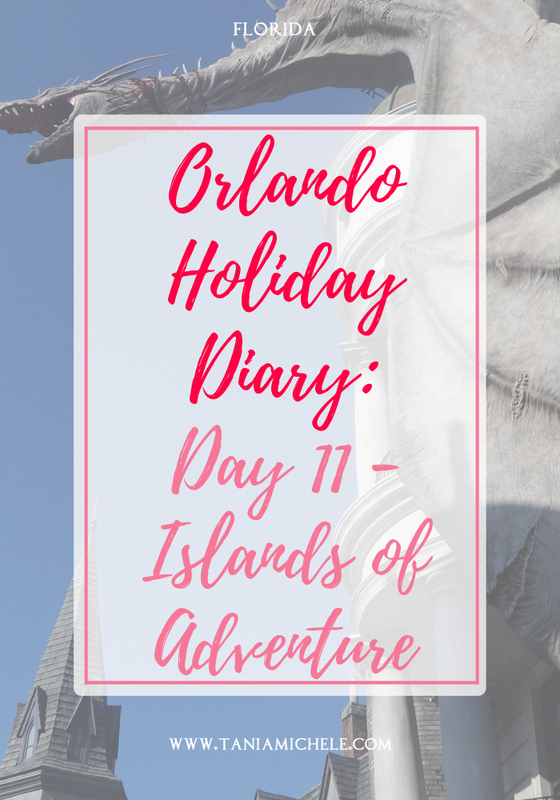 Orlando Holiday Diary: Day 11 - Islands Of Adventure! Waking up to air con and power was a welcome relief after the hurricane had knocked it all out. Thankfully it remained on all night - and didn't got back off for the rest of the holiday. The day was all set for us to head back to Universal's Islands of Adventure, as we wanted to do both parts of the Harry Potter sections in one go. We headed to the parks, and walked past the Simpsons area, as it was the least crowded route. It's a slightly longer walk, but we were able to skip past all the crowds bustling for the same section. As soon as we entered through the brick walkway, we headed straight to the Escape from Gringotts ride, which was already at a 15 minute wait time. It was actually only about 8-10 minutes that we waited, and that was with me stopping to snap a few pictures and a video of the queue line! It was an amazing ride, and I highly recommend it. My dad really liked it to and said 'it wasn't like any other ride' that he's been on! Big praise there from Pa Pryer! By the time we had come off the ride, it was at 30 minutes, so getting there early helped for sure. We then explored all of the shops, along with Knockturn Alley, before we headed to Kings Cross Station to catch the Hogwarts Express to the other park. The ride there is amazing, and is different both ways of the ride. Once in Universal Studios, we had an explore down Hogsmeade, and then lined up for the Forbidden Journey ride. This was thankfully only a 10 minute wait time! It was just as good as the first time I went on it. We then grabbed a bite to eat at the Three Broomsticks, before going off to explore some other parts of the parks. Jurassic River Adventure was closed this day, so we would have to go on it another time! Dad really wanted to go on the new King Kong ride, so we basically walked right onto the ride. It's a 3D one, so me and my sister got a little nauseous from it, but it was still pretty good, and had a few jump scares! I then dragged my dad and sister onto Rip Saw Falls, and Bilge Rat Barges, to which we all got soaked to the bones, and they were cussing me out for the next hour while I was laughing at how wet we all got! From here, we went to get a drink from the Comic Book Cafe, and then while still soaked, we squelched back to the car and headed home. Dad and I spent the evening finishing off the puzzle we started during the hurricane - and promptly went to bed!